Background: Hospitalization and surgery are stressful experiences for children and their parents. Therefore, preoperative preparation of parents becomes essential. Objective: The objectives of this study were to assess the impact of multimodal preoperative preparation program (MPPP) on parental anxiety, to find the association of parental anxiety with the selected demographic variables of parents, and to measure the satisfaction of parents regarding the preparation of children for surgery. Materials and Methods: A quasiexperimental study was conducted in a selected multispecialty hospital. Using the purposive sampling technique, a total of 110 parents of children in the age group 8–12 years were assigned to control (n = 55) and intervention (n = 55) groups, respectively. The MPPP was administered to intervention group. The parents in the control group received the routine preoperative care. 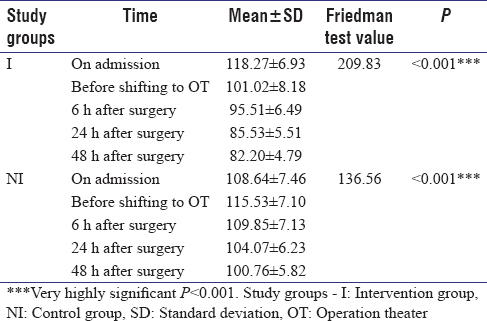 Parental anxiety was assessed on admission before shifting the child to operation theater 6 h, 12 h, and 48 h after surgery whereas the parental satisfaction was measured at 48 h after surgery. Results: The mean scores of parental anxiety were significantly lower in the intervention group than that of control group (P < 0.05). Parents in the intervention group had significantly higher satisfaction level than that of control group (P < 0.05). The study did not find any significant association between the parental anxiety and selected demographic variables of parents. Conclusion: The MPPP is effective in reducing parental anxiety and can be effectively used in pediatric surgical units to prepare the parents for their child's surgery. Surgery of a child is an anxiety-provoking situation to the entire family. Parents may be anxious regarding anesthesia and associated risks, as to how the child would respond to the surgical experience and their own inadequacy in taking care of their child after the discharge from the hospital. Children are influenced by parental advice and guidance in coping with new or stressful situations. Therefore, parents play a critical role in preparing and helping children cope with their surgery. Well-prepared parents in turn, will be able to support their children and help themselves and their children suitably for an upcoming surgery. Thus, it becomes the responsibility of health-care professionals working in pediatric surgery units to prepare children as well as their parents for the surgery. Many strategies have been tried to help children and their parents cope with the upcoming surgery, and despite of these strategies, some children still become distressed during the procedure. Hence, it is important to the identify factors that may influence children's responses to painful medical procedures. When a child undergoes a surgery, it is a stressful experience for the parents as well. It has been found that preoperative anxiety is common among parents. A study in Africa showed that 47% of the parents of children undergoing surgery suffered from psychological distress, while 51% had probable anxiety and 19% had depression. Parental anxiety may be associated with various factors. A study identified specific factors that produced preoperative anxiety in parents – such as age of the child, previous surgery, if any child in the family had undergone surgery, gender of the parents, educational level of the parents, and whether or not parents had received preoperative information from an anesthesiologist before surgery. It has been seen that developmentally appropriate presurgical educational programs, preoperative visits, humor, and distraction are effective in relieving preoperative anxiety in children and their parents. Studies have also shown that adequate parental preparation alone may minimize the anxiety in children. A literature shows that providing information to parents in the form of verbal instructions, video, or written modalities regarding pre-, intra- and postoperative events in a child's surgical journey could improve the knowledge and satisfaction among the parents and decrease their anxiety. It has been proved that individualized education programs were effective in reducing parental anxiety during their child's surgery and improved their satisfaction regarding the preoperative preparation. Reducing preoperative parental anxiety is also a part of preoperative preparation of children. Research studies have shown that video-taped preoperative information, preoperative cognitive behavioral programs, information leaflets, perioperative education program with hands-on experience, and audiovisual information describing the process of undergoing and recovering from anesthesia are useful in reducing preoperative anxiety of parents. When children and their parents are well prepared for the surgery, there will be a decrease in their anxiety which will help them cope with the stressful situation. Less anxious parents will be able to care for their children better. Thus, children will have a speedy postoperative recovery and an early discharge from the hospital. Alleviating the anxiety of parents and preparing them well for the surgery of their children is the responsibility of the health-care professionals working in pediatric surgery units. The researcher in her day-to-day practice has seen that despite routine preoperative preparation, nothing much is done to alleviate parental anxiety. The routine preoperative preparation of children and parents includes only verbal instructions given by doctors and nurses. There is a need for developing a preoperative preparation program customized to the needs of parents. Therefore, to prepare the parents of school-age children for surgery, the researcher has developed a multimodal preoperative preparation program (MPPP) based on the needs of school-age children and their parents. It is an individualized preoperative preparation program for a child undergoing surgery and the accompanying parent. It includes audiovisual instructions along with the real-life situations provided to the child and parent, i.e., an information video, pamphlet, and interactive sessions for children and their parents, medical play, and theater tour for children. It includes audiovisual material that may help the child and parent get information they needed in a more realistic manner. Along with the audiovisual material, the interactive sessions will be more useful as the parent, and the child can interact with the researcher and clear their doubts. Children will be oriented to the theater and provided with medical play which is a real-life experience for them and will be helpful to reduce the preoperative fear and anxiety. Thus, MPPP includes a combination of audiovisual and real-life experience. It was prepared based on the needs and developmental concerns. The program is both for the child and parent, and it aims to increase their confidence and bonding. Given this, the researcher attempted to study the impact of the program on parents' anxiety levels. 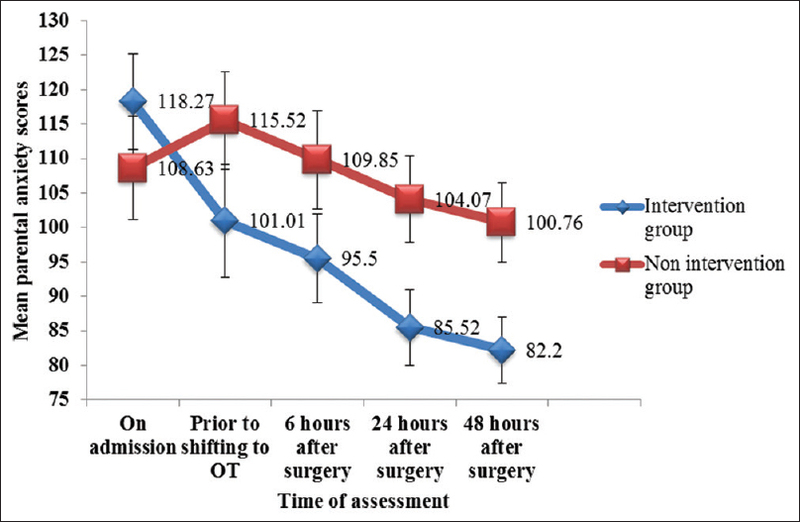 A quasi-experimental study with nonequivalent control group design was conducted in a selected multispecialty hospital with an exclusive pediatric surgical unit at Mangaluru, India. Ethical approval was obtained from the Institutional Ethics Committee. The study population comprised of parents of children aged 8–12 years undergoing elective surgery. Following the informed consent process, assessed the eligibility of the sample to participate in the study based on inclusion and exclusion criteria. Purposive sampling technique was used to select 110 parents to control (n = 55) and intervention (n = 55) groups, respectively. The intervention in the study was the MPPP, was administered by the researcher to the parents in the intervention group. It included audiovisual instructions along with the real-life situations provided to the child and parent, i.e., an information video, pamphlet and interactive sessions for children and their parents, medical play, and theater tour for children. It includes audiovisual material that may help the child and parent get information they needed in a more realistic manner. Along with the audiovisual material, the interactive sessions will be more useful as the parent and the child can interact with the researcher and clear their doubts. Children were oriented to the theater and provided with medical play which is a real-life experience for them and will be helpful to reduce the preoperative parental anxiety. The parents in the control group received the routine preoperative care provided by the hospital staff after the admission of children to the hospital. Researcher collected data using the reliable tools. The demographic pro forma was used to collect the sociodemographic data of parents. The parental anxiety was assessed on admission of the child, before shifting the child to the operation theater, 6 h after surgery, 24 h after surgery, and 48 h after surgery using State-Trait Anxiety Inventory. The researcher also measured parental satisfaction regarding preoperative preparation of children at 48 h after surgery using parental satisfaction scale. Majority of the parents (65.5% in the control group and 74.5% in the intervention group) belonged to the age group of 30–39 years. Majority (99%) were females. Majority (54.5%) of the parents in the control group had high school education whereas majority of them in (43.6%) in intervention group had only primary education. Highest (41.8% in the control group and 45.5% in the intervention group) number of the parents were homemakers. Majority (54.5% in the nonintervention group and 72.7% in the intervention group) of the parents belonged to nuclear family. Majority of the parents (50.9% in the control group and 72.7% in the intervention group were residing at urban area. Majority (52.7%) of the parents in the control group were exposed to surgical procedure in the family whereas majority (50.9%) in the intervention group had not been exposed to surgical procedure in the family. In majority (58.6% of control group and 48.1% of intervention group) of the sample, it was the mother who had undergone surgery. Majority (80% in the control group and 90.9% in the intervention group) of the parents did not have previous surgical experience, and only 29.1% parents in the control group and 32.7% parents in the intervention group prepared their children for surgery. Majority of the parents in both the groups received information from health-care professionals to prepare their children for surgery. Friedman test was used to compare the parental anxiety scores among the groups. It is seen that [Figure 1] in the control group the reduction of parental anxiety was less compared to the reduction in the intervention group. Data in [Table 1] show that there is a significant difference in the mean pre- and post-tests scores of parental anxiety within the intervention (Friedman test value 209.83, P < 0.001) and control (Friedman test value 136.56, P < 0.001) groups. Wilcoxon-signed rank test for the post hoc analysis was used to do the pairwise comparison of parental anxiety among the group at different time points which showed statistically significant changes in mean difference of parental anxiety scores over different time points (P< 0.05). Mann–Whitney test was used compare parental anxiety between the intervention and control groups. It is revealed that there is a statistically significant difference in the mean change scores of parental anxiety between intervention and control groups at different point of time (P< 0.05). Data in [Figure 2] depicts parental satisfaction on various aspects of preoperative preparation of children. It was seen that all the samples (100%) were extremely satisfied with the video. Majority of the sample was extremely satisfied by the theater tour (89.1%), handling of equipment (87.3%), medical play (87.3%), pamphlet (89.1%), interactive sessions (61.8%), and receiving satisfactory answers (52.7%). The figure also shows that 89.1% were extremely satisfied with the overall preoperative preparation of children. 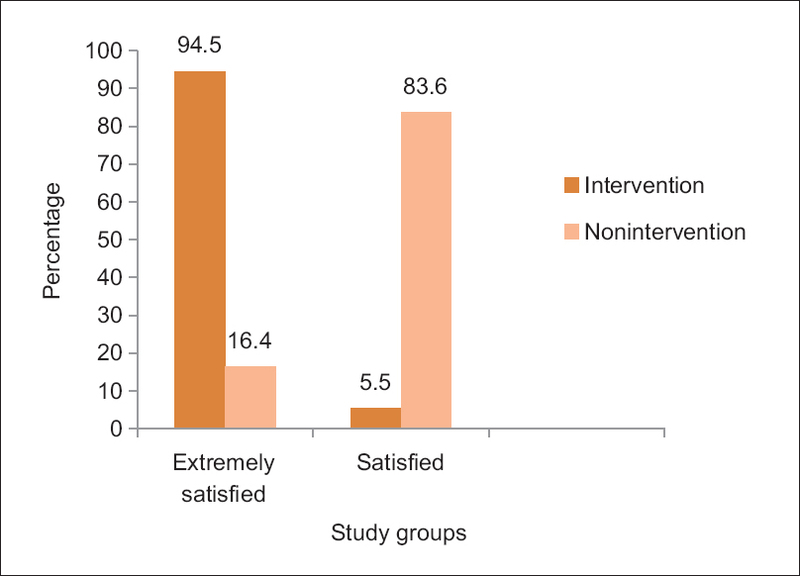 It was also seen that the majority (94.5%) of parents in the intervention group were extremely satisfied whereas in the control group majority (83.6%) of parents were satisfied on the preoperative preparation of children [Figure 3]. To compare the parental satisfaction between the groups, Mann–Whitney test was computed. Data in [Table 2] show that the mean score of parental satisfaction is 1.05 ± 0.22 in the intervention group and 1.84 ± 0.37 in the control group. Computed Mann–Whitney test result is statistically significant (Z = 8.21; P < 0.001). Hence, it is concluded that there is a significant difference in the mean score of parental satisfaction between the groups. Chi-square test was computed to find the association between parental anxiety and demographic variables of parents. The study findings also revealed that there was no significant association between the parental anxiety and demographic variables of parents. Majority of the parents in the current study were in the age group of 30–39 years and a study conducted to assess the preoperative anxiety of parents also had the mean parental age as 35.5 years. Parents play an important role in the preoperative preparation of their children, and at the same time, the surgery of their children can provoke anxiety in them. It is possible that the child's anxiety may be elevated looking at an anxious parent and eventually lead to numerous complications such as delirium and behavioral problems and increased postoperative pain. Preoperative preparation programs will be useful in reducing parental anxiety before surgery and can often be useful in daily practice. Therefore, it is essential to prepare the parents as well for the surgery of children. Thus, in the present study, the parents were also included and the study demonstrated that MPPP has a positive effect in reducing parental anxiety. The previous research studies have demonstrated that preoperative education programs, were effective in reducing preoperative anxiety of parents. The main component of MPPP was the video which the parents watched along with their child and use of video in preparing parents for their child's surgery was effective, It was also seen that when parents view a video demonstrating an inhalation aesthetic induction before the child's surgery, it decreased parental anxiety. A study showed that conventional verbal information along with a leaflet containing information about the anesthetic procedure is effective in reducing parental anxiety, and in the current study, the researcher used an information pamphlet for the parents. The present study finding is also consistent with a literature review which showed that preoperative preparation including a photo file, demonstration of equipment using a role modeling approach, and a tour is found to be beneficial to reduce parental anxiety. Yet another study found that hospital-based intervention is effective in reducing parenting stress among mothers of children undergoing surgery. In this study, parents in both the groups had anxiety when admitted to the hospital. However, after receiving MPPP, parents in the intervention group exhibited lower anxiety scores compared to parents in the control group. This may be because MPPP is an individualized preoperative preparation administered to the parents in the intervention group whereas parents in the control group received only routine preoperative preparation. With regard to parental anxiety, the study did not significant association between parental anxiety and demographic variables of parents; however, this finding is consistent with a study which also showed no significant association between parental anxiety and demographic variables of parents., Meanwhile, another study contradicted the findings of current study where parental anxiety associated with the education of parents. With regard to whether parental anxiety affects, the anxiety of children though it was not studied in the current study, literature has shown that parental preoperative anxiety can influence the child's anxiety as well. It was also seen that maternal socioeconomic and education level was not associated with preoperative anxiety levels in children. Evaluation of parental satisfaction regarding preoperative preparation of children revealed that parents in the intervention group had a higher level of satisfaction than that of the control group (Mann–Whitney Z = 8.211; P < 0.001). These results are consistent with a study where an increased satisfaction was found regarding preoperative preparation of children and parents reported having better perception in health-care services and were impressed by the professional competence and quality of care. Another study revealed that there was 20% increase in parental satisfaction regarding the preoperative preparation of children. Preoperative preparation of children usually involves providing information to the child and parents regarding surgery by doctors and nurses which also the parents in control group received but MPPP received by the parents in the intervention group was an individualized preoperative preparation for the child and parent, where along with the audiovisual mode of education, provision for personal interaction was also thereby which parents could clear their doubts by participating in the interactive session with the investigator. Therefore, it was found that parents in the intervention group were better satisfied than parents in the control group regarding preoperative preparation of children. Preparing parents for their child's surgery is an essential responsibility of health-care professionals. Parental anxiety negatively affects the parents' coping with new or stressful situations while the children are undergoing surgery. It is a challenge for the nurses working in the pediatric surgery units to minimize parental anxiety. As the parents received the MPPP, the knowledge gained regarding the pre-, intra-, and post-operative events enabled them to prepare well for the child's upcoming surgery. Therefore, it is concluded that MPPP is effective and can be successively implemented in pediatric surgery units to minimize parental anxiety. Further studies can be done to develop and implement other interventions that can help parents to cope up with their child's surgery. Health-care facilities can develop this kind of preoperative preparation programs within their policy and protocol. It is a onetime investment for the hospital; however, all the parents and their children getting admitted to the hospital for surgery can be benefitted a lot. Nurses can use this as an effective tool to prepare the parents for their child's surgery as it is an audiovisual device that will enlighten them in a better manner. The authors express sincere thanks to the administrators, doctors, nurses, and other hospital staff of Yenepoya Medical College Hospital Mangalore, Karnataka, for all the support rendered during the study and the parents for being a part of the study. This study was financially supported by Yenepoya University, Mangalore has partly funded this project. Ibanga AJ, Ibanga HB. Psychological Issues in Paediatric Surgery. Paediatric Surgery: A Comprehensive Text for Africa. Global Help; 2011. Available from: http://www.globalhelp.org/publications/books/help_pedsurgeryafrica14.pdf. [Last accessed on 2015 Apr 04]. Piira T, Sugiura T, Champion GD, Donnelly N, Cole AS. The role of parental presence in the context of children's medical procedures: A systematic review. Child Care Health Dev 2005;31:233-43. Taylor C, Sellick K, Greenwood K. The influence of adult behaviors on child coping during venipuncture: A sequential analysis. Res Nurs Health 2011;34:116-31. Brewer S, Gleditsch SL, Syblik D, Tietjens ME, Vacik HW. Pediatric anxiety: Child life intervention in day surgery. J Pediatr Nurs 2006;21:13-22. Osuoji RI, Coker AO, William OM, Ajai O. Assessment of parental distress and psychiatric morbidity before elective surgery in a Lagos teaching hospital. East Cent Afr J Surg 2012;17:22-8. Litman RS, Berger AA, Chhibber A. An evaluation of preoperative anxiety in a population of parents of infants and children undergoing ambulatory surgery. Paediatr Anaesth 1996;6:443-7. Berger J, Wilson D, Potts L, Polivka B. Wacky Wednesday: Use of distraction through humor to reduce preoperative anxiety in children and their parents. J Perianesth Nurs 2014;29:285-91. O'Shea M, Cummins A, Kelleher A. The perceived effectiveness of a pre-admission visit for children (and their parents) undergoing day surgery procedures. J Perioper Pract 2011;21:244-8. Franck LS, Spencer C. Informing parents about anaesthesia for children's surgery: A critical literature review. Patient Educ Couns 2005;59:117-25. Flexible Approaches Needed to Reduce Children's Pre-Operative Anxiety Science Daily; 2013. Available from: http://www.sciencedaily.com/releases/2013/02/130212075218.htm. [Last accessed on 2013 Mar 10]. McEwen A, Moorthy C, Quantock C, Rose H, Kavanagh R. The effect of videotaped preoperative information on parental anxiety during anesthesia induction for elective pediatric procedures. Paediatr Anaesth 2007;17:534-9. Preethy D, Aparna B, Anice G, Renu G, Ashley D. Parental anxiety during children's surgery: The effect of preoperative cognitive behavioural programme. Int J Law Psychol Hum Life 2013;2:1-7. Stone KJ, Glasper EA. Can leaflets assist parents in preparing children for hospital? Br J Nurs 1997;6:1054-8. Adams HA. A perioperative education program for pediatric patients and their parents. AORN J 2011;93:472-81. Scrimin S, Haynes M, Altoè G, Bornstein MH, Axia G. Anxiety and stress in mothers and fathers in the 24 h after their child's surgery. Child Care Health Dev 2009;35:227-33. Caldwell-Andrews AA, Kain ZN, Mayes LC, Kerns RD, Ng D. Motivation and maternal presence during induction of anesthesia. Anesthesiology 2005;103:478-83. William Li HC, Lopez V, Lee TL. Effects of preoperative therapeutic play on outcomes of school-age children undergoing day surgery. Res Nurs Health 2007;30:320-32. Pinto RP, Hollandsworth JG Jr. Using videotape modeling to prepare children psychologically for surgery: Influence of parents and costs versus benefits of providing preparation services. Health Psychol 1989;8:79-95. Zuwala R, Barber, Kimberly R. Reducing anxiety in parents before and during paediatric anaesthesia induction. Am Assoc Nurse Anaesth 2012;17:22-8. Cumino Dde O, Cagno G, Gonçalves VF, Wajman DS, Mathias LA. Impact of preanesthetic information on anxiety of parents and children. Braz J Anesthesiol 2013;63:473-82. Fincher W, Shaw J, Ramelet AS. The effectiveness of a standardised preoperative preparation in reducing child and parent anxiety: A single-blind randomised controlled trial. J Clin Nurs 2012;21:946-55. Mamatha SP, Kumar V, Santhosh P, Sundeep PT. Effectiveness of hospital based intervention on parenting stress among mothers of pediatric surgery children in South India. Int J World Res 2014;1:25-34. Millett CR. The Effect of Music Therapy Interaction on Child and Parental Preoperative Anxiety in Parents of Children Undergoing Day Surgery. Theses and Dissertations-Music Paper. Available from: http://www.uknowledge.uky.edu/music_etds/42. [Last accessed on 2016 Sep 24]. Ria L, Sumithra LA. Effectiveness of video assisted pre-operative preparation programme on anxiety of the mothers of children undergoing surgery-randomized control trial. Int J Nurs Educ Res 2015;3:127-36. Hosseinpour M, Abedi MS, Hamsaie M, Ahmedi B. Preoperative anxiety and its contributing factors in pediatric patients parents undergoing surgery. Iran J Pediatr Surg 2016;2:28-35. Li HC, Lopez V. Effectiveness and appropriateness of therapeutic play intervention in preparing children for surgery: A randomized controlled trial study. J Spec Pediatr Nurs 2008;13:63-73. Lee HM. Therapeutic Play Program for Children Undergoing Day Surgery 2015 [Unpublished thesis). University of Hong Kong, Pokfulam, Hong Kong SAR] Available from: http://www//dx.doi.org/10.5353/th_b4325131/. [Last accessed on 2015 Dec 15].